After 3 years in the making, the very special Donna Hay General Store in Sydney has now opened its doors. It's been a long-time dream of Donna's to collect all her favourite things together in one store. You can now find gifts and goodies from around the world for your home and kitchen in this beautiful restored 1839 sandstone terrace in tony Woolhara. I worked at donna hay magazine for a while and learned a lot about keeping true to your brand essence. 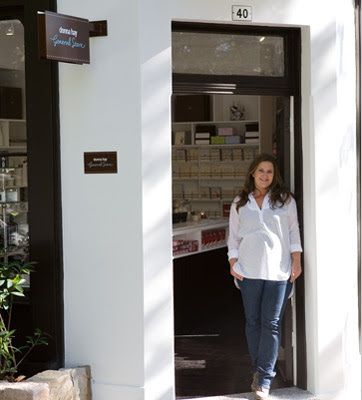 It's this brand essence - a considered, beautiful lifestyle - that Donna has maintained through her magazine, cook books, range of food, homewares, and now her concept store. 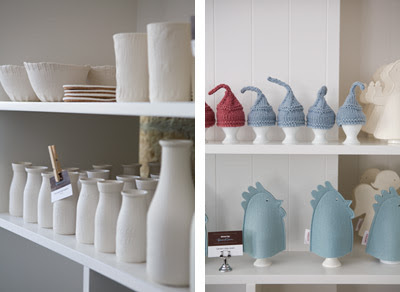 The Donna Hay General Store stocks special gifts and indulgent treats including ceramics, glassware, letterpress stationery, hand-knitted baby gifts, household cleaners and scents, and hand-poured candles. I'm particularly excited about the in-store confiserie, serving up a daily spread of macarons, chocolate truffles, meringues and caramels. The Donna Hay General Store is located at 40 Holdsworth St, Woolhara, NSW and is open from 10am to 6pm, Monday to Saturday. For some great insights into the development of the store, check out Siobhan's interview with Donna Hay on Far Out Brussel Sprout. lmao! I thought the little egg warm things were hats for premmie babies! Another reason to go to Sydney. The macarons, choc truffles + meringues sounds exactly what I need right now. I'm putting it on my ever growing list of shops to visit in Sydney... not sure my hubby will be too pleased though. I have some very similar egg hat warmers that I picked up at a market years ago - makes the eggs look so stylish! My mouth is watering and my stomach growling at the sound of all those treats. Hi Ellie and Clare - I agree - added to the Sydney list. What a great city. I'm looking forward to the day when I can order stuff online. A trip to Sydney would take a bit of organising as I live in Victoria! Hi Sheila, I think ordering online is a super idea too. Fingers crossed!